Even if you’ve never watched an episode of The Joy of Painting, there’s a good chance you’re familiar with artist Bob Ross, with his trademark afro and “happy little trees”. But if you’ve seen his show, then you’ll know that another trademark was his choice of paints. Bob Ross always used the same 13 paints, with decidedly un-Crayolan names like Alizarin Crimson and Pthalo Blue, loading his palette in the same arrangement each time, as you see in the photo above. By limiting his tools and simplifying his techniques, Bob Ross introduced the joy of painting to countless non-artists, and for that he was beloved. As a fan of Bob Ross, I wanted the colors he popularized to live on through the web. I’ve collected their hex values above and created a stylesheet so you can use class names like .phthalo-blue, .phthalo-blue-text, and .phthalo-blue-border to get a Phthalo Blue background, text, and border color respectively. You can grab the CSS, and the SASS used to generate it, below. Great stuff. How did you determine the hex values for these colors? I’ve found a few variations in searching. I based the hex values on those found on this page. Most of the colors tend to have a broad range, but I found these shades to be closest to the Bob Ross paints. Fun! I actually did a Bob Ross class once, and we loaded our palettes the same way. The next step is to do a mixing of colors online. A real blending opaque colors. I just did my first Bob Ross painting 2 nights ago with evergreens, mountains, and water. It turned out absolutely amazing and it was actually pretty easy for me never ever have painted in my life. If your a fan of the show I highly recommend trying it. 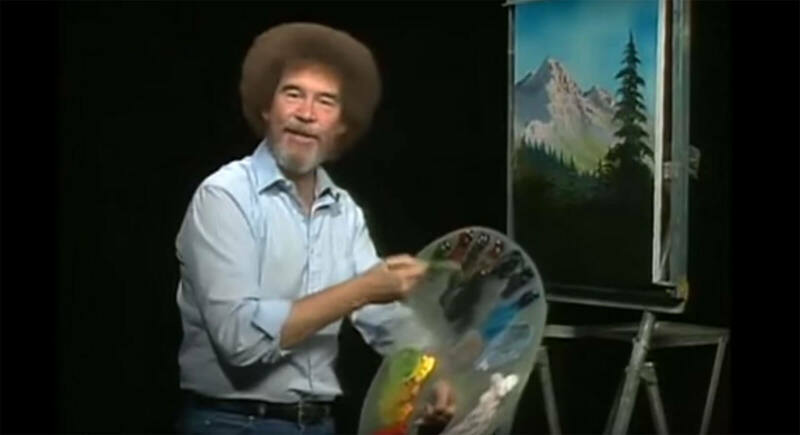 Don’t listen to the haters saying oils are too messy or that Bob Ross wasn’t a real artist, because he was and always will be a legend and oils are easy! Try Hobby Lobby, because they sell his setups. Thank you now I know how and where to find his exact color palette! I live in the Reno/Lake Tahoe Region and there is a Hobby Lobby in Reno. So, do I just go in and ask them for the Bob Ross paints? How much money will it be to get just one sei of all his oil colors? Do u happen to know? For anyone wanting to just dive right in to painting like Bob, there is a website that will get you exactly what he used to paint. 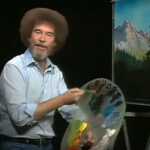 http://www.bobross.com is loaded with all the tools you’ll need. BTW: Thanks for the color codes. I’m messing around with digital art and wanted to try my hand at some vague Bob Ross stuff so this helps immensely. This was great! Thanks. I got all the information I was looking for. Netflix has Bob Ross and I’m an instant fan. Painting is so relaxing and joyful when you get something that looks ok! Moving into photoshop, these helps understand the color hues more clearly. Are there any other colors that he has ever used in his TV Shows? Thanks for this! Very useful info. I was very suspicious that my cadmium looked too ochre, so I forked out for some proper Bob Ross, and it was completely different from the “Cadmium yellow” that I’d purchased (Winsor and Newton, Winton Oil Colour). Anyway, thank you for identifying these values! Just started looking at painting and have very limited budget so can’t fork our for loads of different colors etc. Is there a way of mixing two or more other colors to make prussian blue and van dyke brown? This helped me a lot to do what I wanted. Thanks a lot! Can’t forget the Van Dyke! You get the colors wrong.